Many Missouri stream and lake enthusiasts may be unaware of an invasion that threatens the aquatic resources that we love. While most of us understand the danger posed to our aquatic environments by foreign invaders such as zebra mussels and Asian carp, it is harder to wrap our minds around the idea that crayfish, a key component of Missouri’s stream and lake fisheries, are also invading and threatening our waterways. But it’s happening, it’s a serious problem, and anglers and other aquatic enthusiasts should be concerned about this threat. Invasive species are now the second most important problem facing biologists who manage aquatic ecosystems in the United States (U.S.), right after habitat loss. Aquatic invaders are the threat that keeps fisheries managers awake at night. Crayfish (also known as crawfish and crawdads) are among the most important prey for many Missouri sport fish. Research shows what many anglers already know — crayfish provide fuel for catfishes, trout, and walleye, and they compose most of the diets of popular species such as smallmouth bass, goggle-eye, and adult largemouth bass. However, few people understand that crayfish play other critical ecological roles in our streams, lakes, and wetlands. Crayfish feed more than 200 wildlife species that live in and around our waterways. Their omnivorous diets (they eat nearly everything) and intense predation allow them to partially control the kinds and abundance of plants and other animals (fish food such as insects and snails) in these ecosystems. Their constant work breaking down dead and decaying plants into food for other animals drives food chains and nutrient cycles. They can affect water clarity when over-abundant. In short, crayfish play an unusually important or keystone ecological role in many fisheries and aquatic environments due to their ability to alter food chains and their environment. So how does an organism with so many beneficial traits become a problem? First, understand that while we mostly hear about a few crayfish species, such as the infamous and highly invasive rusty crayfish, there are actually more than 400 crayfish species in North America. Many have small native ranges where, over many thousands of years, they have established a balance with the plants and other animals in their environment. But when a crayfish species is moved out of its native range to unfamiliar streams and lakes, even if they are nearby, we can’t predict how it will interact with its new environment. For example, the red swamp crawfish is native to the southeastern U.S., including a very small part of Missouri where it plays a natural role in the community. But elsewhere the red swamp crawfish has become one of the most invasive crayfish species in the world. The same story plays out within state boundaries and with many other crayfish species. Several crayfish species that are native to a particular region of Missouri become invasive when moved to other locations in the state. The White River crawfish, also native to a small part of southeastern Missouri and the Mississippi River, has invaded at least 11 waterways in other parts of the state. Biolo;gists have discovered other species disappear;ing at some of these locations. Species like red swamp crawfish and White River crawfish are hardy and adaptable to a wide variety of con;ditions. Many are aggressive, territorial, and readily reproduce. These traits combined with omnivorous and intense feeding habits make them perfect invaders, suited to overpopulate, out-compete native crayfish and fish species for food and shelter, and alter the ecological balance of their new homes. Though the well-known rusty crayfish is among the most invasive North American crayfish, many other crayfish species possess similar traits and capabilities to extend their range and cause problems. A recent survey of all U.S. state fisheries chiefs found that about half had problems in their states linked to invasive crayfish. Research shows that invasive crayfish cause population declines or elimination of native crayfish species, amphibians, and reptiles. They are also linked with reduced fish abundances and sport fishery declines in streams and lakes. These fish declines occur for several possible reasons. Invasive crayfish alter and destroy habitat, especially aquatic plant beds used by many fish for cover, foraging, spawning, or nursery habitat for young. They often overpopulate and then overgraze fish food such as insects and snails, and insect food such as algae. This leaves less overall food for our prized sport fish. Invasive crayfish prey on sport fish eggs. They also carry diseases and parasites that could affect many animals. Because crayfish play such a key ecological role, the effects of invasive crayfish reverberate throughout the food chain and often disrupt the way aquatic systems function. This is not to say that every crayfish invasion will have such dramatic results. Streams and lakes are complicated ecosystems with many interacting influences. It is difficult to predict the results of every invasion. But we do not want to leave the future condition of our waterways and fisheries to chance. In fact, it appears that crayfish invasions are being identified at an alarming rate throughout the U.S. Missouri Department of Conservation biologists have documented more than 20 crayfish invasions in Missouri. In every one of these 20-plus invasions, the invading species is native to some part of our state, but has been moved to another. All of the invasions that have been studied are spreading in size. Department biologists recently reported one invasion that spread about 1.4 stream miles in only one year. And as these invasive crayfish spread throughout streams, native crayfish species are disappearing. To date we have witnessed declines of at least six native species in Missouri. We don’t yet know whether or how other aquatic life forms (insects, fish, amphibians, reptiles, plants, etc.) are being affected, but data from many other states sug;gest that food chains and ecological function are suffering. Some wonder why it’s a problem if a native crayfish species is eliminated and replaced by an invasive crayfish species. It’s a good question with multiple answers. First, different species, even closely related ones, have different interactions with other community members. Their substitution will often change the way an ecosystem functions and the way people value that system. This is seen with closely related crayfish species, but it might be easier illustrated using species that are better known to most readers. For example, smallmouth bass and spotted bass are native Missouri sport fish species that don’t always naturally occur together. They look similar, but play different ecological roles. They also hold much different value with the fishing public — the smallmouth bass is generally more highly prized. Spotted bass are not native to Missouri’s Meramec River drainage but invaded there, and are negatively impacting smallmouth bass in much of the drainage (and even impacting largemouth bass in streams). The Department of Conservation received so many complaints about this invasion that regulations were passed to allow liberal harvest of spotted bass in this drainage to manage this invasion. Another problem with replacement of native crayfish species by invaders is that invasive crayfish populations often rapidly overpopulate waters where they invade, showing much greater abundances than those shown by natives. Overpopulated invasive crayfish overgraze their food sources, often the same food eaten by fish species such as basses, goggle-eye, trout, and catfish. This leaves less food for fish, translating to slower fish growth, fewer numbers of fish, and less-productive fisheries. Because the production of most fisheries naturally varies, subtle changes caused by invasive crayfishes can go undetected or be mistakenly blamed on other factors. 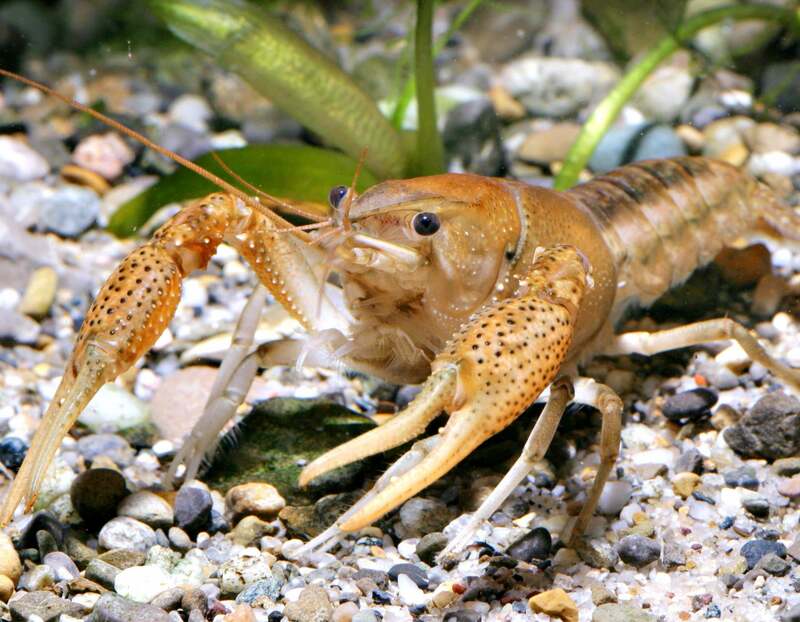 Overpopulated invasive crayfish also reduce or eliminate aquatic plant beds that are important habitats for fish food organisms such as insects, smaller fishes, and spawning and nursery habitats for sport fishes such as smallmouth bass, largemouth bass, goggle-eye, and sunfishes. The process of destroying these plant beds also muddies waters, leading to less-productive fisheries and poorer water quality for all who enjoy these systems. Crayfish invasions are not only bad news for aquatic ecosystems and fisheries, but they can affect local and regional economies. U.S. anglers spent about $22 billion on fishing trip food, lodging, transportation, and associated costs in 2011. State governments haven’t yet conducted research to measure widespread eco;nomic effects of crayfish invasions. However, a recent Notre Dame University study focusing on only one Wisconsin county affected by crayfish invasions provides insight. Researchers estimated economic losses directly tied to the degraded or altered fisheries in that county were more than $1.5 million annually! We must also consider the amount of money that conservation agencies are forced to spend on addressing these invasions, money that otherwise would be directed to managing our natural resources. So how are invasive crayfish moving around and expanding their ranges? Baitbucket introductions, or live release of leftover bait by anglers, is widely considered the primary pathway for invasive crayfish in the U.S. Other known pathways in;clude transport by the aquaculture industry and live releases by hobby aquarists and even school teachers. Recent surveys reveal that release of live fishing bait is a serious problem. A significant percentage of anglers admitted to baitbucket introductions in Wisconsin/Michigan (12 percent), Missouri (40 percent), and Maryland (69 percent). Unfortunately, once crayfish invasions have taken hold, it is nearly impossible to eliminate them. The key to managing crayfish invasions is proactive prevention of introductions. Most states, including Missouri, prohibit the release of live crayfish into natural waters. In addition, many natural resource agencies, including the Department of Conservation, and nongovernmental organizations have started or increased campaigns to educate the public about invasions. In a perfect world, these educational efforts would prevent future crayfish introductions. However, natural resource agencies have learned that they must combine education efforts with some amount of regulation. The Department has been gathering input and working closely with a diverse group of stakeholders, including bait shop dealers, hatchery owners, conservation organizations, university scientists, and anglers. The Department also collected information online and provided periodic updates and presentations to the Conservation Commission. Information gained from all stakeholders will be used in order to ensure the right balance of regulations for all involved. The engagement of citizens and stakeholders has been crucial to this regulation review process. The invasive crayfish problem is large, growing, and causing real dam;age to treasured aquatic resources throughout the U.S. and Missouri. People transporting and releasing live crayfish into new water bodies is one cause of this problem, and it is an illegal act in Missouri. Natural resource agencies can’t be everywhere at all times to enforce regulations and educate those who might introduce these invaders. Part of the solution lies with the public. The thought of a favorite fishery or neighborhood stream being invaded should be enough to cause most of us to speak up and help educate fellow resource users and other members of our communities. Only together do we have a chance of protecting our valuable waterways and fisheries from this rapidly growing threat. These game birds may be the ultimate wing-shooting challenge. Updating Missouri’s Wildlife Code to safeguard the public trust and address threats to our state’s resources, including protecting deer from chronic wasting disease.